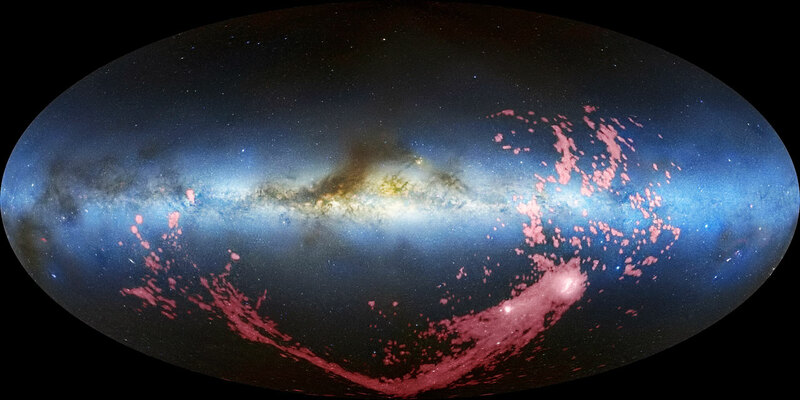 Astronomers using the NASA/ESA Hubble Space Telescope have solved the 40-year-old mystery of the origin of the Magellanic Stream, a long ribbon of gas stretching nearly halfway around the Milky Way. 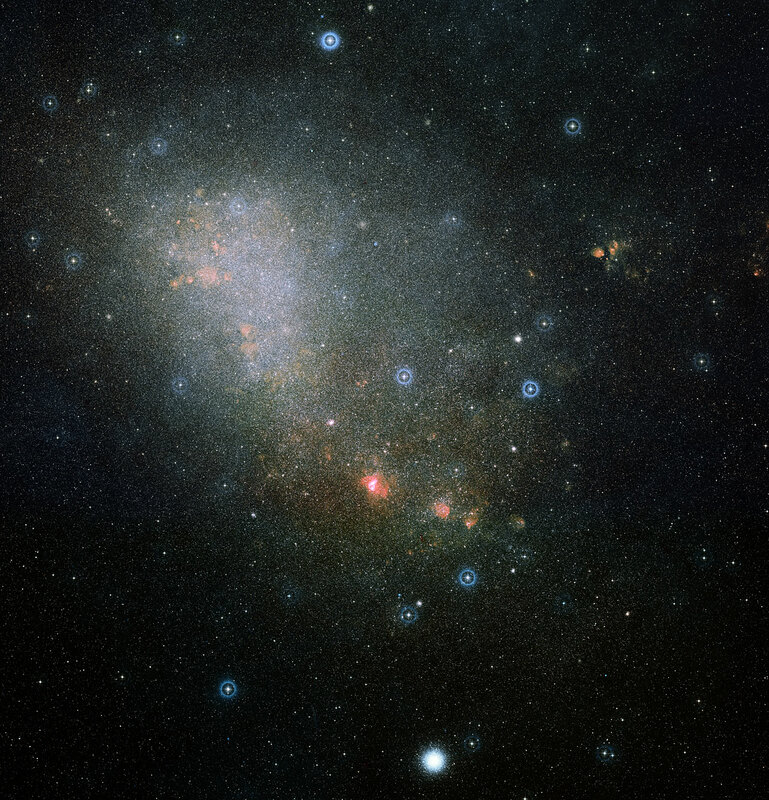 New Hubble observations reveal that most of this stream was stripped from the Small Magellanic Cloud some two billion years ago, with a smaller portion originating more recently from its larger neighbour. The Magellanic Clouds, two dwarf galaxies orbiting our galaxy, are at the head of a huge gaseous filament known as the Magellanic Stream. Since the Stream's discovery in the early 1970s, astronomers have wondered whether this gas comes from one or both of the satellite galaxies. Now, new Hubble observations show that most of the gas was stripped from the Small Magellanic Cloud about two billion years ago — but surprisingly, a second region of the stream was formed more recently from the Large Magellanic Cloud. 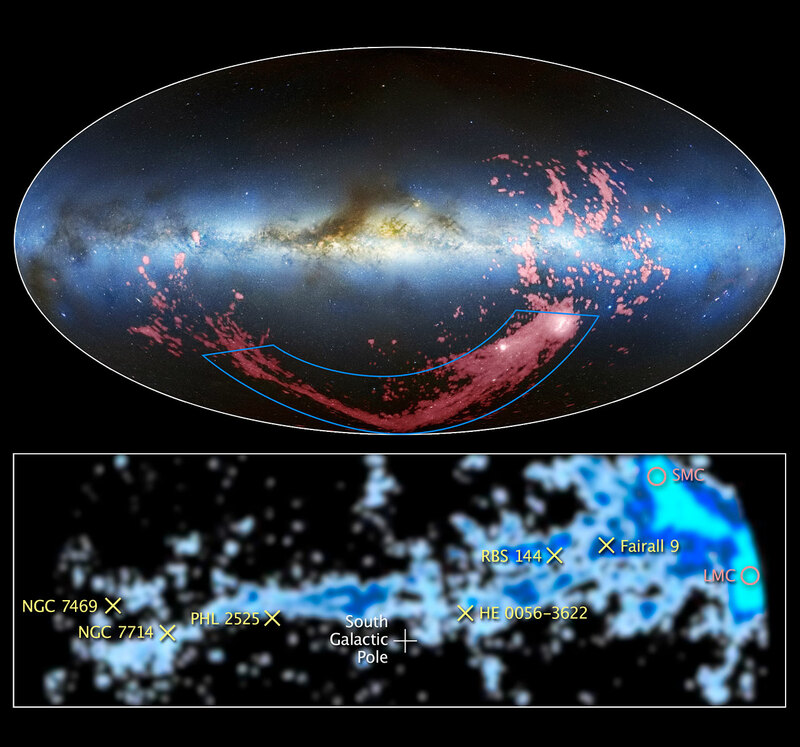 A team of astronomers determined the source of the gas filament by using Hubble's Cosmic Origins Spectrograph (COS), along with observations from ESO's Very Large Telescope, to measure the abundances  of heavy elements, such as oxygen and sulphur, at six locations along the Magellanic Stream. COS detected these elements from the way they absorb the ultraviolet light released by faraway quasars as it passes through the foreground Stream. Quasars are the brilliant cores of active galaxies. The team found low abundances of oxygen and sulphur along most of the stream, matching the levels in the Small Magellanic Cloud about two billion years ago, when the gaseous ribbon was thought to have been formed. 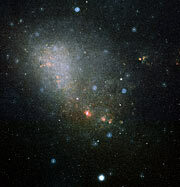 In a surprising twist, the team discovered a much higher level of sulphur in a region closer to the Magellanic Clouds. "We're finding a consistent amount of heavy elements in the stream until we get very close to the Magellanic Clouds, and then the heavy element levels go up," says Andrew Fox, a staff member supported by ESA at the Space Telescope Science Institute, USA, and lead author of one of two new papers reporting these results. "This inner region is very similar in composition to the Large Magellanic Cloud, suggesting it was ripped out of that galaxy more recently." This discovery was unexpected; computer models of the Stream predicted that the gas came entirely out of the Small Magellanic Cloud, which has a weaker gravitational pull than its more massive cousin. "As Earth's atmosphere absorbs ultraviolet light, it's hard to measure the amounts of these elements accurately, as you need to look in the ultraviolet part of the spectrum to see them," says Philipp Richter of the University of Potsdam, Germany, and lead author on the second of the two papers. "So you have to go to space. Only Hubble is capable of taking measurements like these." 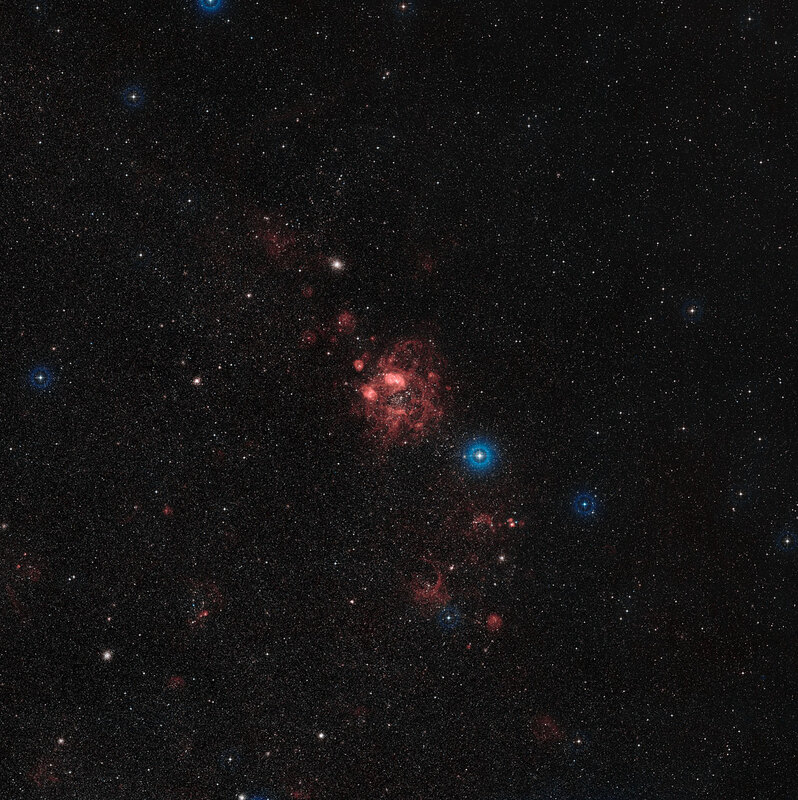 All of the Milky Way's nearby satellite galaxies have lost most of their gas content — except the Magellanic Clouds. As they are more massive than these other satellites they can cling on to this gas, using it to form new stars. However, these Clouds are approaching the Milky Way and its halo of hot gas. As they drift closer to us, the pressure of this hot halo pushes their gas out into space. This process, together with the gravitational tug-of-war between the two Magellanic Clouds, is thought to have formed the Magellanic Stream . "Exploring the origin of such a large stream of gas so close to the Milky Way is important," adds Fox. "We now know which of our famous neighbours, the Magellanic Clouds, created this gas ribbon, which may eventually fall onto our own galaxy and spark new star formation. 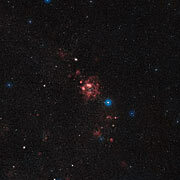 It's an important step forward in figuring out how galaxies obtain gas and form new stars." The "abundance" of an element is a measure of how common it is in its environment relative to other elements. The Magellanic Clouds can be used as a good testing ground for theories on how galaxies strip gas from one another and form new stars. This process seems episodic rather than smooth, without a continuous, slow stream of gas being stripped away from a small galaxy by a larger one. As both of the Magellanic Clouds are approaching our own galaxy, the Milky Way, they can be used to explore the dynamics of this process. These results are presented in a set of two papers, both published in the 1 August issue of The Astrophysical Journal. The first of these papers is entitled "The COS/UVES absorption survey of the Magellanic Stream: I. One-tenth solar abundances along the body of the stream". The international team of astronomers in this study consists of A. J. Fox (STScI, USA; ESA), P. Richter (University of Potsdam; Leibniz Institute for Astrophysics, Potsdam, Germany), B. P. Wakker (University of Wisconsin-Madison, USA), N. Lehner (University of Notre Dame, USA), J. C. Howk (University of Notre Dame, USA), N. B. Bekhti (University of Bonn, Germany), J. Bland-Hawthorn (University of Sydney, Australia), S. Lucas (University College London, UK). The second of these papers is entitled "The COS/UVES absorption survey of the Magellanic Stream: II. Evidence for a complex enrichment history of the stream from the Fairall 9 sightline". The international team of astronomers in this study consists of P. Richter (University of Potsdam; Leibniz Institute for Astrophysics, Potsdam, Germany), A. J. Fox (STScI, USA; ESA), B. P. Wakker (University of Wisconsin-Madison, USA), N. Lehner (University of Notre Dame, USA), J. C. Howk (University of Notre Dame, USA), J. Bland-Hawthorn (University of Sydney, Australia), N. B. Bekhti (University of Bonn, Germany), C. Fechner (University of Potsdam, Germany). Image credit: David L. Nidever, et al., NRAO/AUI/NSF and Mellinger, LAB Survey, Parkes Observatory, Westerbork Observatory, and Arecibo Observatory.